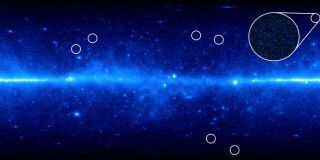 This is a view of the universe from NASA's Fermi Gamma-ray Space Telescope. Physicists at Brown University studied seven dwarf galaxies (circled in white). Their observations indicate those galaxies are full of dark matter because their stars’ motion cannot be explained by their mass alone, making them ideal places to search for dark matter annihilation signals. Physicists have set the most precise limit yet on the mass of dark matter, the mysterious and elusive stuff that is thought to make up 98 percent of all matter in the universe and nearly a quarter of its total mass. The researchers used data from NASA's Fermi Gamma-ray Space Telescope to set parameters on the mass of dark matter particles by calculating the rate at which they appear to collide with their antimatter partners and annihilate each other in galaxies that orbit our own Milky Way. Savvas Koushiappas, an assistant professor in the department of physics at Brown University, and graduate student Alex Geringer-Sameth found that dark matter particles must have a mass greater than 40 giga-electron volts (GeV) — approximately 42 times the mass of a proton. "What we find is if a particle's mass is less than 40 GeV, then it cannot be the dark matter particle," Koushiappas said in a statement. The details of the study will be published in the Dec. 1 issue of the journal Physical Review Letters. The results throw into question recent findings from underground experiments that reported the potential detection of dark matter, the researchers said. Dark matter is invisible, and scientists have long tried in vain to directly detect the mysterious particles. But since dark matter has mass, its presence is inferred based on the gravitational pull it exerts on regular matter. But it's more complicated than that. In the 1920s, astronomer Edwin Hubble discovered that the universe is not static, but is expanding. More than 70 years later, observations from the Hubble Space Telescope, which was named for the astronomer, found that the universe was expanding at a much more rapid pace than it was earlier. Cosmologists think a mysterious force called dark energy is behind this puzzling acceleration. Dark energy, like dark matter, has not been directly detected, but it is thought to be the force pulling the cosmos apart at ever-increasing speeds. "If, for the sake of argument, a dark matter particle's mass is less than 40 GeV, it means the amount of dark matter in the universe today would be so much that the universe would not be expanding at the accelerated rate we observe," Koushiappas said. Dark energy is thought to make up 73 percent of the total mass and energy in the universe. Dark matter accounts for 23 percent, which leaves only 4 percent of the universe composed of the regular matter that can be seen, such as stars, planets, galaxies and people. But because neither dark matter nor dark energy has been directly detected, they remain unproven concepts. In at least one respect, dark matter is thought to behave like normal matter: When a dark matter particle meets its matching antimatter partner, they should destroy each other. Antimatter is a sibling to normal matter; an antimatter partner particle is thought to exist for each matter particle, with the same mass but opposite charge. Scientists suspect that dark matter is made of particles called WIMPs ("weakly interacting massive particles"). When a WIMP and its anti-particle collide, they should annihilate one another. To examine the mass of dark matter, Koushiappas and Geringer-Sameth essentially reversed the process of annihilation. The researchers observed seven dwarf galaxies that are thought to be full of dark matter because the motion of the stars within them cannot be fully explained by their mass alone. Since these dwarf galaxies also contain much less hydrogen gas and other regular matter, they help paint a clearer picture of dark matter and its effects, Koushiappas said. The physicists worked backward using data from the last three years that was collected by the Fermi telescope, which observes the universe in high-energy gamma-ray light. By measuring the number of light particles, called photons, in the galaxies, the scientists calculated backward to deduce how often particles called quarks are produced, which are products of the WIMP-anti-WIMP annihilation reaction. This enabled the physicists to establish limits on the mass of dark matter particles and the rate at which they annihilate. "This is a very exciting time in the dark matter search, because many experimental tools are finally catching up to long-standing theories about what dark matter actually is," Geringer-Sameth said in a statement. "We are starting to really put these theories to the test."